Why is working with celebrities and Hollywood starlets still relevant to marketing and communication? Does it depend on the brand? On the strategy? Or is it just an easy way to get people to know about your brand? Dmitry is pretty clear about how this works. First of all, research is conducted to figure out a brand’s values. Then the potential brand ambassador’s image is studied. If the two factors are compatible, they are put together in a huge campaign (as to why celebrities are motivated to be a part of such collaborations, the “yippeekay-all-the-way-to-the-bank-motherf*cker” paradigm might provide you with an answer… but we digress). But why use an ambassador and not, we’re just spitballing here, an overarching concept with user-generated content and multimedia-integration? The reason is simple: an ambassador is simple. A famous face is noticeable, draws attention (still the number one goal of brand communication) and you don’t have to understand that much of it. Yes, you read that last one right. “Lack of ideas” can actually be a good thing for a campaign. There’s no ‘idea’ that needs to convince consumers or customers. There’s an ‘instant’ effect that comes with the use of a celebrity. It’s kind of playing safe, having a famous person in your campaign. Bank exec: “Sold!” (for an estimated 1 million dollars, as tweeted through the grapevines. But we digress once more). On the other hand, it’s kind of a risk. What if the celebrity’s image falls apart, or worse: the celebrity himself does? That’s what happened to BioStabil in 1990. BioStabil is a golden yin and yang pendant that makes you ‘healthier’. As brand ambassador they chose popular singer Nico Haak to be the face of their campaign. His grinning mug was put in newspaper ‘De Telegraaf’, just above the tagline “I wear my lucky bracelet every day!”. A few pages before the ad, the singer’s obituary drew a bit more attention, though. Does the celebrity fit your brand identity? Does the celebrity fit your target group? What values and emotions are associated with your celebrity? Does the product fit the celebrity? Is there a risk of controversy? How popular is the celebrity? Is the celebrity physically attractive? Has the celebrity been linked to other brands before? Does the celebrity use your product or brand already? What is the celebrity’s job? How many of these questions require a positive answer before linking an ambassador to your brand? That’s up to you. You should also ask yourself if you need an instant effect or if there’s room for a more subtle approach. 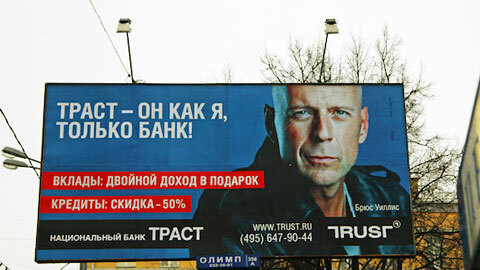 To put it quite bluntly: there’s a spectrum with ‘no brainer’ ads on one hand (Bruce Willis plugging your bank on a billboard, Nicole Kidman sipping your lemonade whilst unzipping her dress) and ‘smart’ advertisements on the other, created by a team of promising young guns who want to use a more surprising concept and innovative forms of communication. When does choosing a celebrity make more sense than going for a ‘smart’ campaign? The answer to this question doesn’t only depend on the brand itself. Gone are the days when conservative brands chose famous ambassadors and cutting edge brands came up with a more ‘original’ concept. The list of pros goes for any kind of brand. For example: do you know Uniqlo? No? You will. Uniqlo is a painfully hip chain of stores that sells its own brand of clothing. A bit like H&M. Uniqlo has grown a lot over the years and surely will want to take the American market by storm. Consumers who had already discovered Uniqlo, had done so through word of mouth or the attractive, creative and efficient ‘smart’ advertisements the brand developed, like the Uniqlo clock. The ‘Uniqlock’ is a screensaver that features a clock that sometimes gets switched for clips of dancing Japanese people, dressed in the latest styles from Uniqlo. Totally cool, but also very cult. But what do you do when you’re really hip but also really want to expand? H&M were once faced with the exact same dilemma. They severed the Gordian knot (successfully) when they partnered up with Johnny Depp in 1998. H&M used to have the image of being a knock-off chain, not capable of original thought but only copying higher end brands. Their stores were also new to the high street. How did they solve their image problem? Not with some punny tagline or overarching concept that needed extensive explanation. “Stick a famous face on it”, they said. Done. 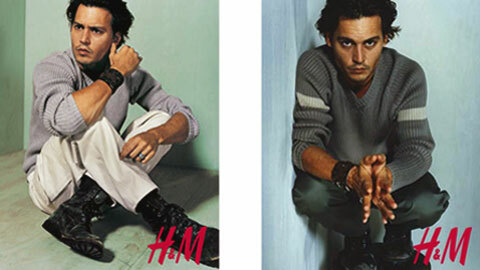 Johnny Depp is real, rebellious, handsome and popular. And as a result, the same was said of their clothes. Uniqlo has been positioning itself as a smarter, more design-oriented alternative for a while now, also to chains like H&M. Would they use the same techniques as their big competitor? Of course they would. 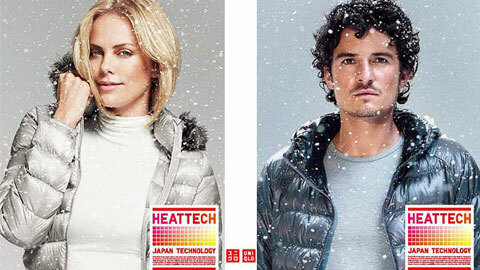 With a new (seriously pricey) Uniqlo flagship store on 5th Avenue and plans of global expansion on the horizon, Uniqlo has tapped Charlize Theron and Orlando Bloom to be the new brand ambassadors. Their job is to embody the new tagline “Made For All” (“Uniqlo, it’s like me – only it’s clothes” sadly was already taken). Result? So whether you choose a celebrity strategy or not has less to do with brand identity and more with brand size (cool fashion brands and banks use this tactic, as long as they want to be big enough). You can be as cult as you like, when it comes to convincing the financial planner and Joe the Plumber: you’ll always be better off with a Hollywood A-lister instead of a digital clock with twirling ballet dancers.